I will hardly spoil the ending by assuring you that these dreams come true – and that the path to them is charmingly illustrated (as were the Series of Unfortunate Events) by Brett Helquist. 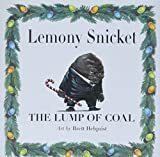 And that the lump’s adventures are marked by Mr. Snicket’s signature narratorial interruptions of his story for cryptic personal revelations, his idiosyncratic definitions of words possibly not familiar to his audience, and his winning mix of the fantastic and the depressingly mundane. For any of you who know Tim Burton’s The Melancholy Death of Oyster Boy and Other Stories (which includes several Christmas offerings – my favorite, “James,” features a Burton drawing a Santa-suited arm offering a teddy bear to a doubtful looking little boy who has several parallel gashes across one eye; the text reads: “Unwisely, Santa offered a teddy bear to James, unaware that he had been mauled by a grizzly bear earlier that year.”) – The Lump adds another volume to the genre of Edward Gorey-ian cynical, morbid, and eccentric illustrated works that take the form of children’s stories but are really much more for grown ups. "Let's keep things simple, for we must do our best to keep things simple, otherwise we would be utterly lost" is one of the refrains found in the new translation of Perec's novella. A new biography reveals how J. Allen Hynek’s life and legend exemplify a lost era. UFO sightings still make the news, but Hynek was something different: a public intellectual who told us to watch the skies. When you’re living through watch-it-through-your-fingers reality what makes for good escapism? I’d like to make the case for a memoir about life with a mortally ill child. And let me add: I am a new mother.